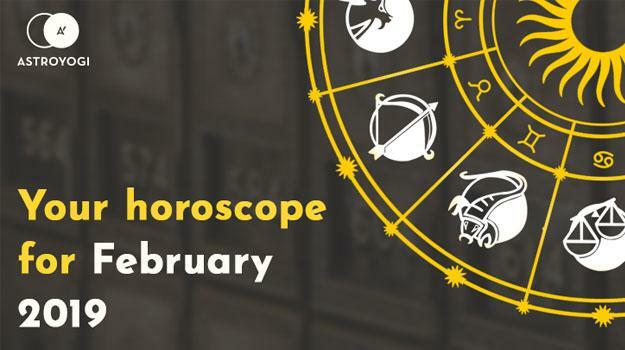 Expert astrologers of Astroyogi give out the monthly horoscope for February 2019. For personalized horoscope analysis and future insights consult our experts online. Welcome to February, dear Aries! With the sun in Capricorn, you continue to enjoy a professionally excellent period – your capacity and capabilities are elevated to supreme heights and you are able to conquer any work-related hurdle. You feel regenerated and able to put your fiery energy to good use. On the 13th, the sun moves into eccentric Aquarius, lending you self-confidence and further propelling your professional trajectory. This is also a favourable period for educational pursuits, wealth, health and love. With Mercury in Capricorn, you bring a fresh level of enthusiasm to everything and especially to the world of work. By the 7th, Mercury moves into Aquarius and you will be hyper, almost manic, longing to be everywhere and doing everything. You also enter into a romantic phase. On the 25th, Mercury moves into Pisces and you may find that your escapades have caught up with you. At this time, you enjoy retreating and hibernating into a world of warmth and relaxation. This need should be honoured to order to balance your equilibrium. Venus in Sagittarius bolsters the impact of friends in your life. On the 24th, Venus moves into Capricorn, suggesting that there will be an opportunity to start something new. Love may also be on the cards. On the 6th, Mars moves into Aries which lends energy, zest and oomph to proceedings. You will feel carefree and active and this energy will be contagious. India’s best astrologers are available 24/7 on Astroyogi for online consultation. With the sun in Capricorn, you enjoy a secure financial future, and may be bolstered by an inheritance. You feel physically and mentally happy, which draws others to you almost magnetically. You may be a source of inspiration to someone whose spirits need lifting. Your personal life is undergoing an enjoyable metamorphosis and your attitude is liable to change for good. By the 13th, the sun moves into Aquarius which brings you a beguiling level of enthusiasm ensuring that you enjoy your work. You feel well rested and able to conquer that which needs doing. In terms of life, the path runs smooth which you appreciate as you are not prone to the dramatic like your fiery counterparts! With Mercury in Capricorn, concentration will not be at its best. You may feel more Gemini-like mentally, distracted by endless bright and shiny ideas. On the 7th, Mercury moves into Aquarius which is a brilliant placement for professional development and acceleration. You are appreciated for your foresight and dependability, meaning that you may move up the ladder quicker than anticipated. On the 25th, Mercury moves into Pisces which creates a serene and mystical love life. Be careful that you are not seeing someone through rose-tinted glasses. On the 24th, Venus moves into sagely Capricorn, who keeps you in a financially secure and personally popular position. By the 6th, Mars moves from Pisces to Aries, where it focuses on communication and your ability to charm friends and lovers with words, as well as actions. India’s best astrologers are available 24/7 on Astroyogi for online consultation. With the sun in Capricorn, mental tension may impact you. You feel much anxiety regarding the future. Your will power is what will save you, especially if you are able to harness your energy in a valuable and meaningful direction. Remember thoughts are like wild horses, and we must find a way to make them work for us rather than buck and charge relentlessly. On the 13th, the sun moves into Aquarius which generates social gatherings and meetings as well as much support from those younger than you. Your mind will get into gear and you will think cautiously before you do anything. This is a good period for clarity and decisive decision making. With Mercury in Capricorn, you may find many unexpected resources come your way. Use these wisely. By the 7th, Mercury moves into Aquarius ensuring that you will need to be alert, especially emotionally, as you may feel out of sorts. Identifying what triggers you and understanding how to self-sooth will be of paramount importance. On the 25th, Mercury moves into Pisces heralding a professionally good period. This is also a time of good luck during which you impress others simply by being you – you don’t need to go to any extra lengths in order to entertain or charm. You are enough as you are. On the 24th, Venus moves into Capricorn, which may urge you to focus on your education, although there may be some anxiety and worry generated. On the 6th, Mars moves into Aries creating and solidifying a strong positive outlook and joy for life that feels innate and authentic. India’s best astrologers are available 24/7 on Astroyogi for online consultation. With the sun in Capricorn, your focus is on your relationship and your urge to rekindle waning flames. Remember, passion can be harnessed into something more sustainable with less likelihood of burns! At work there is a steady level of progression, giving you something to work towards. On the 13th, the sun moves into Aquarius. Life feels ‘okay’ with plenty of room for improvement. After all, you want life to feel magnificent. However okay is a good place from which to springboard into stupendous. The key is to keep your confidence up. With Mercury in Capricorn, relationships may feel suffocating. Problems may rise to the surface. At least this way they can be dealt with appropriately. On the 7th, Mercury moves into Aquarius keeping you at your best professionally, drawing attention from all sides. You may draw a love interest in the office! On the 25th, Mercury moves into Pisces which can trigger a need to withdraw and to be less active socially. The symbol of Cancer, the crab, represents this urge well. Sometimes we must retreat into ourselves in order to replenish, especially when we feel vulnerable or in need of protection. Honour this need and take good care of yourself. You will feel better for it. With Venus moving into Capricorn on the 24th, you may feel confused whilst also longing to expand your horizons. Yoga and meditation may assist. On the 6th, Mars moves into cardinal Aries. Aries energy may feel frenetic to you at this time, but it may give you the extra push you need to get things done. India’s best astrologers are available 24/7 on Astroyogi for online consultation. Drawn to growth, your career may be under the microscope this week as you long to dissect your path and put it back together. Bigger, better, bolder – that’s your motto. On the 13th, as the sun moves into Aquarius, you may struggle to concentrate, although brilliant ideas do lurk beyond the confusion, ready to be captured and harnessed. With Mercury in Capricorn, you enjoy a blossoming artistic period. You are creative, inventive and imaginative and able to harness quite intriguing concepts, rendering them tangible and understandable to others. On the 7th, Mercury moves into Aquarius which puts the focus on health. How are your health practices right now Leo? Do you eat well? Do you meditate? Are you exercising in a way that brings joy and movement to your body? By the 25th, as Mercury moves into Pisces you will enjoy popularity both at work and socially. You will be the most talked about person, which suits you just fine, so enjoy the show! You bring an expansive energy to proceedings and attract others with your grandiose show of warmth. On the 24th, as Venus moves into Capricorn, you are advised to be precautious with money. Ensure that you save more than you spend. On the 6th, Mars moves into fiery Aries which synergises well with your own powerful energy ensuring that your hard work pays off. You will have strong reserves of energy to call upon as and when needed and whatever course of action you decide upon, will be completed. You’ll make sure of that! India’s best astrologers are available 24/7 on Astroyogi for online consultation. Your ability to communicate is vital to your success as well as your happiness. Ruled by Mercury, you have an affinity for the little ways in which people need to be talked to and acknowledged. This personal touch guarantees that others respond very well to you. On the 13th, the sun moves into Aquarius guaranteeing a blossoming love life. You may be drawn to someone different, someone against your usual type. This can make for a very enjoyable and exciting experience. With Mercury in Capricorn, plans falling through may lead to stress, anxiety and irritation. Try to regroup as soon as possible to avoid feeding into a negative spiral. On the 7th, Mercury moves into Aquarius promoting strong health. Virgo is particularly interested in health, both its own and other peoples. Have you considered a career in which you operate as some form of healer? On the 25th, Mercury moves into soulful Pisces which suggests a need to embrace the spiritual realm. Practices like meditation and yoga call to you and feel your spirit at this time. The spiritual side of your life needs to be fed in order for you to feel better so ensure that you make time for this. On the 24th, Venus moves from Sagittarius into Capricorn ensuring that plenty of employment opportunities are open to you. On the 6th, Mars moves from Pisces to Aries which gives you a much-needed boost, especially at work. The boisterous and enthusiastic energy of Aries may lead you into love. India’s best astrologers are available 24/7 on Astroyogi for online consultation. The socialite of the zodiac, the sun in Capricorn encourages you to embrace your social tendencies, spending time with friends and loved ones. There is a joyous aspect to relationships that leaves you on cloud nine. When your relationships are harmonious and mutually beneficial, you feel elated. On the 13th, the sun moves into Aquarius which can generate a degree of self-consciousness regarding your image. Air signs are always somewhat aware of how they come across to others, they simply can’t help it as they are so in their heads but let this awareness of your image help rather than hinder. Act in line with the person that you want to be in the eyes of others. With Mercury in Capricorn, mothers enjoy a plentiful period and many new friendships are forged. The elders in your family are supportive of your path. Seek them out when you need their guidance. On the 7th, Mercury moves into Aquarius which can lead to a lack of focus. Meditation and yoga, both practiced consistently, will assist with calming the mind. On the 25th, Mercury moves into Pisces which bolsters and promotes good health as well as a promising financial situation. There will be a degree of unhealthy competition in the workplace, but you will not be affected or influenced by it. On the 24th, Venus moves from Sagittarius to Capricorn which generates a jolly and infectious mood that others long to be around. On the 6th, Mars moves into Aries which keeps you lucky in all endeavours and draws you towards spiritual and romantic matters. India’s best astrologers are available 24/7 on Astroyogi for online consultation. With the sun in Capricorn, you’ll continue to be in a very sociable state of mind. There is a need to reach out and be among people, decrying your typical preference of being a loner and fiercely independent. By the 13th, as the sun moves into Aquarius, you’ll have a fresh new focus: work. You’ll find a strong sense of accomplishment and success accompanies you in all you do. It is important for you to feel needed at this time, and work grants you this sense of fulfilment. With Mercury in Capricorn, you may encounter some financial issues so be prudent with your spending. On the 7th, Mercury moves into Aquarius which encourages you to spend quality time with family and uplifts relationships between mothers and sons. There is a sense of harmony and a positive atmosphere at home. On the 24th, Venus moves into Capricorn which invites you to control your temper which may prove to be fiery! Volatile emotions may surface, and you may be unsure what to do with them. Channel them into exercise or positive endeavours – do not allow them to fester within. On the 6th, Mars moves into Aries which can deplete your self-confidence. What builds you back up? Invest time in the things that bring you happiness to restore balance. India’s best astrologers are available 24/7 on Astroyogi for online consultation. With the sun in Capricorn, you’ll enjoy a wonderful period of prosperity. Financially especially, this is a truly awesome month for you, despite your spontaneous approach to spending and saving. You will be able to make profitable decisions that benefit your entire family. On the 13th, as the sun moves into Aquarius, you will be supported by luck that runs alongside all you do. You may take a few short trips. With Mercury in Capricorn, your innovative ideas will bolster your financial situation. On the 7th, as Mercury moves into Aquarius, you may fret about something, which you should share with those closest to you. You will feel lighter if you lift the problem from your own shoulders. On the 25th, Mercury moves into Pisces and your personal life enjoys a time of plenty and prosperity. You also feel in a romantic frame of mind, which is delightful news for your partner! On the 24th, Venus moves into Capricorn triggering immense financial gain. Capricorn is like the dragon from myth who hoards treasure – this sign is very good at accruing wealth. What you’ll want to do is ensure that you use it wisely and proactively, rather than simply sitting on it. On the 6th, Mars moves into Aries, suggesting a hasty marriage or perhaps rash tempers within relationships. Your career poses new challenges which encourage you to rise to the occasion. India’s best astrologers are available 24/7 on Astroyogi for online consultation. The sun in your own sign of Capricorn indicates struggles in your relationship with your father. Capricorn rules the patriarch and all things that it represents, including time and money. There is a sense of rigidness in all Capricorn’s, an innate need to accrue things and to follow a sense of order and timeliness. If your relationship with your father is poor, try to mend it now. Your desire to expand your energy in a new direction is strong and should be utilised. On the 13th, the sun moves into Aquarius giving you the opportunity to rid yourself of a chronic illness. Your self-confidence rises. Mercury in Capricorn spikes your imagination – remember you need to put in the work to achieve the ideas that until now have only existed in your head. There needs to be a collaboration between the mind and the body. On the 7th, Mercury moves into Aquarius creating plenty of opportunities for students. Relatives will encourage you all the way. On the 25th, Mercury moves into Pisces and you are urged to avoid unnecessary conflicts with relatives. It’s important to keep a cool head. At work you may feel afraid, is it that you are afraid of being replaced or not performing well? Remember, you are your own worst critic. On the 24th, Venus moves into Capricorn profiting those who work in the fashion industry. There is a simmering sense of excitement that encourages you to flourish. On the 6th, Mars moves into Aries promoting victory and accomplishment. Aries gives fire to your earth, enabling you to achieve practically anything. India’s best astrologers are available 24/7 on Astroyogi for online consultation. You start this month with low confidence. The sun in Capricorn stifles you somewhat. You feel like a muzzled horse. This is not the time to make big decisions – focusing on work will assist as a distraction and positive outlet for your energy. By the 13th, the sun will move into Aquarius and your ability to innovate will benefit you. Your powerful brain and unique way of thinking drive opportunity and financial blessings. Your self-confidence escalates, and you feel you can do anything. A busy schedule may leave you to feel that you can’t do it all – this is where organisation and planning will be useful. With Mercury in Capricorn you may feel lazy and lacking in confidence. On the 7th, Mercury moves into Aquarius and your ability to concentrate may be dampened making it crucial that you learn how to dim down the distractions. Even the best minds make little progress if they are constantly side-lined by every bright, shiny new thing that comes along. On the 25th, Mercury moves into Pisces ensuring profit, in terms of cash or jewellery. Your ability to communicate is the key to your success socially, as well as at work. On the 24th, Venus moves into Capricorn which can trigger unnecessary expenses so be mindful of your spending habits. Do you really need that thing, or do you simply want it? On the 6th, Mars moves into Aries which triggers fame and deep recognition. This is a good placement in all ways. What you want is clear to you. India’s best astrologers are available 24/7 on Astroyogi for online consultation. The sun in Capricorn creates an excellent period for you in which you continue to see accelerated growth and progress. The key to your success is an ability to plan which ensures that you use your time wisely and effectively. Your personal life could best be described as ‘smooth sailing.’ On the 13th, the sun moves into Aquarius and you may find that your confidence takes a knock. With Mercury in Capricorn, you may feel inclined to begin a new relationship. You are minded towards commitment, patience and loyalty. On the 7th, Mercury moves into Aquarius, life still runs smoothly but you may be distracted in love. Remember to make sure that your partner feels appreciated. On the 25th, Mercury moves into Pisces which triggers a need to go overseas, there may also be a sense of melancholy, nostalgia or sentimentality in your personal life. Try to appreciate the past whilst focusing firmly on the now. On the 24th, Venus moves into Capricorn which causes you to seek out the support of elders. This is a wonderful time for falling in love and all that comes with it. You are ready to embrace it all. With Mars in Aries on the 6th, you will see things happening positively in your life and receive appreciation for all you do. Spending quality time with family appeals greatly to you and should be honoured. India’s best astrologers are available 24/7 on Astroyogi for online consultation.